"Remineralization guided by peptides is a healthy alternative to current dental health care," said lead author Mehmet Sarikaya, professor of materials science and engineering and adjunct professor in the Department of Chemical Engineering and Department of Oral Health Sciences. The new biogenic dental products can—in theory—rebuild teeth and cure cavities without today's costly and uncomfortable treatments. 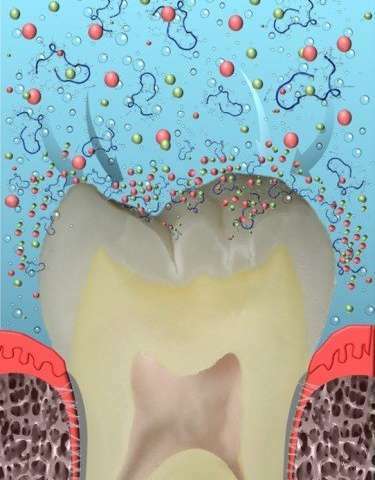 "Bacteria metabolize sugar and other fermentable carbohydrates in oral environments and acid, as a by-product, will demineralize the dental enamel," said co-author Sami Dogan, associate professor in the Department of Restorative Dentistry at the UW School of Dentistry. Although tooth decay is relatively harmless in its earliest stages, once the cavity progresses through the tooth's enamel, serious health concerns arise. If left untreated, tooth decay can lead to tooth loss. This can present adverse consequences on the remaining teeth and supporting tissues and on the patient's general health, including life-threating conditions. Taking inspiration from the body's own natural tooth-forming proteins, the UW team has come up with a way to repair the tooth enamel. The researchers accomplished this by capturing the essence of amelogenin—a protein crucial to forming the hard crown enamel—to design amelogenin-derived peptides that biomineralize and are the key active ingredient in the new technology. The bioinspired repair process restores the mineral structure found in native tooth enamel. "These peptides are proven to bind onto tooth surfaces and recruit calcium and phosphate ions," said Deniz Yucesoy, a co-author and a doctoral student at the UW. Going to the Dentist is the most costly health item my family faces, so far, knock on wood (superstitious!) Research is very costly, so is there any indication what this will do for costs? If only people could eliminate White Sugar from there diet? Long ago, I was advised to stop eat white sugar and candies and eat dried fruits instead. After that my teeth become much healthier.